Play is a powerful force, not only in the lives of children, but also in the natural world. Many animals have active play lives, and this is particularly true of companion animals, such as dogs and cats. Research on the human-animal bond has clearly illustrated many important benefits of this ages-old relationship, and the evidence that Animal Assisted Therapies (AAT) are beneficial for a wide range of developmental, educational, and clinical outcomes for children and adults is growing substantially. 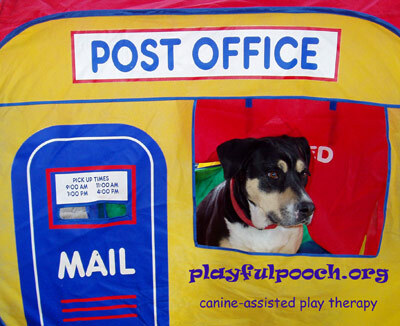 The Playful Pooch Program is designed to provide canine-assisted play therapy services to children and families and to offer training in the involvement of canines in play therapy to mental health professionals. Canine-Assisted Play Therapy is a combination of the well-established fields of Animal Assisted Therapy and Play Therapy. Playful child-canine interactions are systematically used to make progress toward therapeutic goals. Substantial research has clearly demonstrated the importance of the human-animal bond as well as the value of properly trained animals for treating children with a wide range of difficulties. The Playful Pooch Program is just one part of the child’s overall treatment, but it can facilitate progress on many dimensions. It can be appropriate for all ages. This website is designed to provide information about the involvement of animals in child therapy and play therapy, and especially dogs. Related articles, research, and resources are included here. 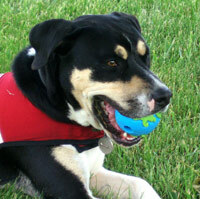 Download a brochure about the Playful Pooch Program. Definition of "Pet Play Therapy"
Use the link below or click on the photo to read a recent article about canines in play therapy, written by Dr. VanFleet. 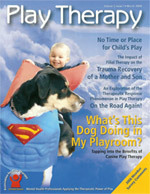 The article is posted and made available here by the generous permission of the Association for Play Therapy, who published it in the March 2008 issue of the Play Therapy magazine. All rights are reserved. The PDF is large (6.8MB), so please be patient while it downloads and do not close the browser window that opens, the article will load in that window. This article was a finalist in the Dog Writers Association of America 2008 competition for best feature in a special interest magazine. VanFleet, R. (2008). What's this dog doing in my playroom? Play Therapy, 3 (1), 18-21. Risë VanFleet, Ph.D., RPT-S is a licensed psychologist and registered play therapist-supervisor with 35 years of clinical and leadership experience in a variety of settings. She is the president of the Family Enhancement & Play Therapy Center, Inc. in Boiling Springs, PA. She is the clinical consultant for the Beech Street Program. Dr. VanFleet is the founder of the International Collaborative on Play Therapy and a Past President/Board Chair of the Association for Play Therapy. She has authored several books on filial/family therapy, numerous chapters on play therapy, and is featured on 4 DVD workshops. Risë has trained thousands worldwide, and she has received 2 prestigious national awards for her work. She is also the author of award-winning Play Therapy with Kids and Canines: Benefits for Children’s Developmental and Psychosocial Health. She is an Approved Evaluator with the American Kennel Club’s Canine Good Citizens Program, a full member of the Association of Pet Dog Trainers and the Dog Writers Association of America, and an affiliate of the International Society for Anthrozoology. 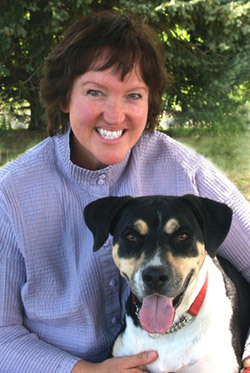 She is responsible for the Playful Pooch Program and offers training programs in Canine-Assisted Play Therapy. 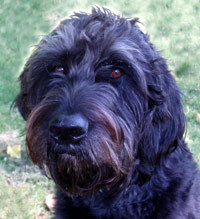 She is also involved in ongoing research on the use of animals in conjunction with therapy. Kirrie is a trained play therapy dog. She is a 4-year-old rescued border collie mix. She is very playful and she truly enjoys being with children and families. Henry is a 2-year-old Labradoodle (half Lab and half Poodle), recently adopted by Cindy Sniscak, President of the Beech Street Program, and her family. Henry's original human companion died recently, and her wish was for Henry to work with children in the Playful Pooch Program, so he moved here from quite far away to do just that! © Copyright 2016 Risë VanFleet. All Rights Reserved.